Write-ahead logging (WAL), also referred to as journaling, is best described in the ARIES papers but we can get away with a less academic description: SQL Server will first describe in the log any change is about to make, before modifying any data. There is a brief description of this protocol at SQL Server 2000 I/O Basics and the CSS team has put forward a much referenced presentation at How It Works: Bob Dorr’s SQL Server I/O Presentation. What is important for us in the context of this article is that a consequence of the WAL protocol is that any change that occurred to any data stored in SQL Server must be described somewhere in the log. Remember now that all your database objects (tables, views, stored procedures, users, permissions etc) are stored as data in the database (yes, metadata is still data) so it follows that any change that occurred to any object in the database is also described somewhere in the log. And when I say every operation I really do mean every operation, including the often misunderstood minimally logged and bulk logged operations, and the so called “non-logged” operations, like TRUNCATE. In truth there is no such thing as a non-logged operation. For all practical purposes everything is logged and everything leaves a trace in the log that can be discovered. The image above shows how 3 concurrent transactions were lay out in the log: the first transaction contains two insert and a delete operation, the second one contains an insert but had rolled back hence it contains a compensating delete and the last operation committed two deletes and an insert operation. Although all three transactions run ‘simultaneous’ the true order of operation is the one in the log, given by the LSN. Usually when analyzing the log we need to look at operations from specific transactions. The key field is the [Transaction ID] column which contains the system degenerate transaction ID for each operation logged. All operations logged by a transaction will have the same [Transaction ID] value. We can recognize some of the transactions in our script. Remember that SQL Server will always operate under a transaction, and if one is not explictly started then SQL Server itself will start one for the the statement being executed. At LSN 20:5d:2 we started transaction 2d0 named CREATE TABLE, so this must be the implicit transaction started for the CREATE TABLE statement. At LSN 20:9b:2 the transaction id 2d6 named INSERT is for our first standalone INSERT statement, and similarly LSNs 20:a0:2 starts transaction 2d9, 20:a1:1 starts 2da, LSN 20:a2:1 starts xact 2db, LSN 20:a3:1 starts xact 2db and LSN 20:a3:1 starts xact 2dc respectively. For those of you that detect a certain pattern in the LSN numbering the explanation is given in my What is an LSN: Log Sequence Number article. And if hex number are familiar to you then you’ll also recognize that the transaction ID is basically an incrementing number. 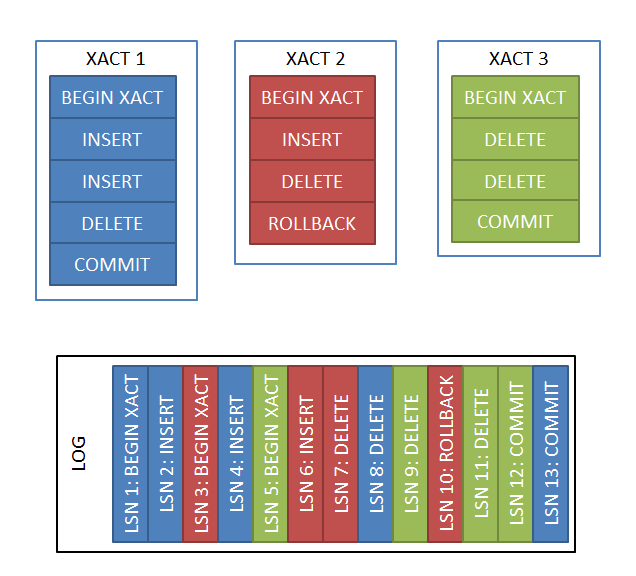 The LSN 20:a4:1 that starts xact 2dd is a little bit different because is named user_transaction. This is how explicit transactions started with BEGIN TRANSACTION show up. There are no more implicit transactions named INSERT for the 5 INSERT statements inside the explicit transaction because the INSERT statement did not have to start an implicit transaction: it used the explicit transaction started by the BEGIN TRANSACTION statement. Finally the LSN 20:aa:1 starts the implicit xact 2df for the DELETE statement. In addition we also see a number of transactions that we cannot correlate directly with a statement from their name. Transactions 2d2, 2d3, 2d4 and 2d5 are SplitPage transactions. SplitPage transactions are how SQL Server maintains the structural key order constraints of B-Trees and there is ample literature on this subject, see Tracking page splits using the transaction log or How expensive are page splits in terms of transaction log?. 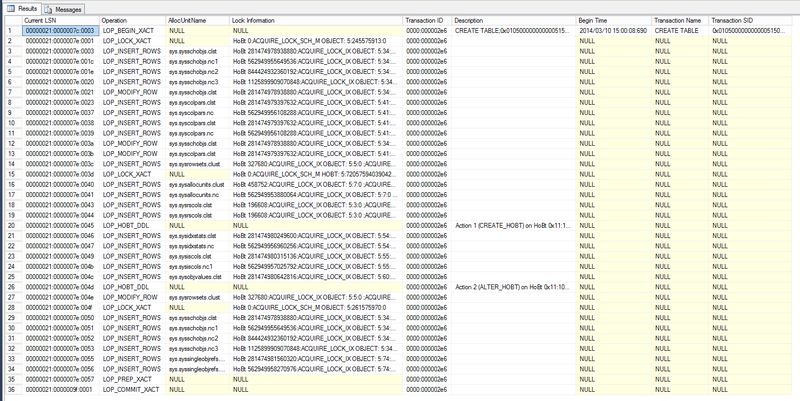 Notice that all these SlipPage transactions have the same Parent Transaction ID of 2d0 which is the CREATE TABLE xact. These are page splits that occur in the metadata catalog tables that are being inserted into by the CREATE TABLE operation. We can also see that right after the first INSERT a transaction named Allocate Root was started. Tables are normally created w/o any page and the very first INSERT will trigger the allocation of the first page for the table. the allocation occurs in a separate transaction that is committed imedeatly so it allows other inserts in the table to proceed even if the insert that actually triggered the allocation stalls (does not commit, or even rolls back). This capability of starting and committing transactions in a session independently of the session main transaction exists in the SQL Server, but is not exposed in any way to the T-SQL programming surface. The Transaction SID column shows the SID of the login that started the transaction. You can use the SUSER_SNAME function to retrieve the actual login username. I choose to look at the xact ID 2d6, which is the first INSERT operation. The result may seem arcane, but there is a lot of useful info if one knows where to look. First the trivial: the xact is 2d6 has 4 operations in the log. Every transaction must have an LOP_BEGIN_XACT and a record to close the xact, usually LOP_COMMIT_XACT. The other two operation are a recording of locks acquired (LOP_LOCK_XACT) and an actual data modification (LOP_INSERT_ROWS). the meat and potatoes lay with the data modification operation, but we’ll see later how LOP_LOCK_XACT can also be extremely useful in analysis. Operations that modify data, like LOP_INSERT_ROWS will always log the physical details of the operation (page id, slot id) and the object which they modified: the allocation unit id (see sys.allocation_units) and the partition id (see sys.partitions). Remember that even non-partitioned tables are still represented in sys.partitions, you can think at them as being partitioned with a single partition for the whole table. The AllocUnitName column in fn_dblog output shows the is ussualy the simplest way to identify which operations affected a specific table. Using the Page ID and Slot ID is one way to search for log records that affected a row of interest. Indeed the page 5:1:79 at slot 0 contains the first INSERT from our script. The fn_dblog output matches what we find in the database. Besides the academic interest, this info has practical use: if we want to know what transaction modified a certain record and we know the record position (page, slot) we can search the log for records that updated that particular position. Alas, this approach has its drawbacks. The biggest problem is that in B-Trees the position of a record is very mobile. Page split operations move records and change their physical location, thus making it harder to find the transactions that modified the record. We again located the same row, the first INSERT. Remember that lock resource hashes, by definition, can produce false positives due to hash collision. But the probability is low enough and one must simply exercise common sense if a collision is encountered (eg. the SELECT above returns more than one row for the desired lock resource hash). The script finds the lock resource hash value for the row with the 'junk' data value, it then finds the transaction ID that locked such a row and finally it shows all the operations this transaction did. There are couple of leaps-of-faith here: I assume that the lock resource hash is unique and I also assume that the first transaction that locks this row is the transaction we're interested in. In a real life scenario things can get significantly more complex because hash collisions and because there could be multiple transactions that locked the row with the lock resource we're interested in. Even w/o fully understanding the log record internals, we can use some educated guess to figure out which UPDATE did the modification by looking at the log record payloads. The UPDATE we're interested in is the xact 2e2. From the LOP_BEGIN_XACT log operation for this xact we can, again, figure out when did the change occurred and who did it. We found 3 transactions that had the string 'important' in the log record payload. We know xact 2e0 is the original INSERT and we found xact 2e3 to contain an LOP_DELETE_ROWS, which is the log record for DELETE operations. Using this brute force approach we did find the transaction that deleted the record that contained the 'important' string. A note of caution is warranted here: my example uses a simple ASCII string. One must understand how the values are represented in binary to search the log payload for known values. This is quite tricky for more complex values, as you need to know the internal representation format (eg. the numeric/decimal types) and be able to write the correct Intel platform LSB value for types like int or datetime. The transaction is a stats auto-update. The actual string 'important' was copied into the stats when the automatically generated stats where created and thus the log record for the internal stats blob maintenance update operation will, obviously, contain the string 'important'. For a brief introduction into fn_dump_dblog see Using fn_dblog, fn_dump_dblog, and restoring with STOPBEFOREMARK to an LSN. Having the capability to analize database log backups is critical in such forensic investigations. The same techniques apply as the one I showed using fn_dblog, but typically you will have to search through many log backup files. Because the TABLOCKX hint was used the [Lock Information] does not contain the lock resource hash for the individual row deleted, it contains the record of the table X lock. However the log record payload still contains the deleted row image and we could still search using the [Log Record] or the [Log Contents 0..5] fields. The [Page ID] and [Slot ID] are also present and we could use them to try to identify the log records that affected the row we're interested in. Another case that makes investigating the log difficult is minimally logged operations. With minimally logging the log contains only a record that describes the fact that a certain page contains minimally logged changes and the SQL Server engine must guarantee that that page is flushed to disk before the transaction commits, see Operations That Can Be Minimally Logged. In such a case the only record youl'll see will be the LOP_FORMAT_PAGE with the [Page ID] of the page that contains minimally logged operations. The good news, for such investigations, is that only INSERT and blob .WRITE updates can be minimally logged (and the legacy, deprecated, WRITETEXT/UPDATETEXT), so the sheer problem space is reduced as most data modifications, and specially accidental modifications, cannot be minimally logged and thus will leave a full blown trace in the log. There is also an opposite case, when the log contain more information about updates: when the table is an article in a transactional replication publication, but I will not enter into details on this topic. My short demo operated on a tiny log. In real cases is not unusual to have to dig out one log record out of millions. And is just very very slow. In my experience is usually better to copy the log first into a temp table, at least the fields of interest and a relevant portion. This table can be then indexed as needed (eg. by [Transaction ID]) and analysis can be done much faster. It also helps if one can restrict the start and end LSN of interest because fn_dblog can return results much faster if is restricted to known LSNs. The shorter the interval (more appropriate LSNs), the faster the investigation. Be careful though as fn_dblog will cause a server core dump if the LSNs passed in are incorrect... on a live production server this can equate several minutes of a complete SQL Server freeze! Log analysis can be used for investigating modification to the database schema (DDL changes) using the same methods as one used to analyze data changes. Just remember that databases store their schema inside the database, and every single object is described in one or more catalog (system) tables. All DDL changes end up as data changes done to these catalog tables. Interpreting the catalog changes (insert/update/delete of rows in catalog tables) though is not trivial. The fact that all DDL changes are catalog changes also means that all DDL changes look the same. An LOP_INSER_ROWS into sys.syschhobjs could mean a CREATE TABLE, but it could just as well mean a CREATE VIEW or CREATE PROCEDURE. Furthermore, CREATE TABLE foo will look very similar to CREATE TABLE bar when analyzing the log. One of the main differences from data changes log analysis is using data locks to identify rows: with DDL changes you should not try to follow the actual data locks (locks on catalog table rows acquired as the DDL changes are being applied as basic INSERT/UPDATE/DELETE operation. Instead you should try to locate metadata locks. In general DDL operations will start with a SCH_M lock record which contains the object ID of the object being modified. Another problem with doing schema modification analysis using the log is that the way SQL Server uses the system catalog to store its metadata changes between releases. So even if you figured out one way to interpret the log to understand what kind of DDL change occurred, you can discover that another SQL Server version uses a very different system catalog structure and changes look completely different on that version. You can rely on the system catalog (and therefore the way DDL operations appear in the log) as being consistent between SQL Server editions and between service packs and cumulative updates of the same version (this later point actually has a couple of exceptions, but is not worth talking about them). This is insert of the object record into sys.objects. There are four insert records because there is a clustered index and four non-clustered indexes of syssysschobjs catalog table. These are two insert of column record into sys.columns. Each insert has two records, one for the clustered index one for the non-clustered index. This is the insert into sys.indexes. This is the insert into sys.index_columns. This is an insert in sys.objects of an object related to the table, but not the table itself. In this case is the primary key constraint, but identifying this sort of information is usually tricky. The best approach is to simply use cast([RowLog Contents 0] as nchar(4000)) and look for some human readable string, that would be the name of the object inserted. In my case the log record content revealed the string PK__test__3213E83F1364FB13 so I could easily deduce that is the default named primary key constraint. As you can see I did not retrieve exactly the DDL that run, but I have a very good idea what happened: the table was created at 2014/03/10 15:00:08:690, it initially contained two columns and a primary key constraint. Using the same trick of casting the log record content to NCHAR(4000) I could easily retrieve the original column names. My example is for a very simple CREATE TABLE statement, more complex statements can generate more complex log signatures. Partitioning in special adds a lot of LOP_INSERT_ROWS records because every individual partition must be described in sys.sysrowsets and every column for every partition and for every index must be described in sys.sysrscols. And that is before the low level HoBT metadata is being described, see SQL Server table columns under the hood. Again we can see the transaction name that reveals the type of DDL operation (is an ALTER TABLE), the time it occurred and the SID of the user that issued the change. The LOP_INSERT_ROWS into sys.syscolpars.clst tells me this is a DDL change that added a column to the table. Again we have the the transaction time, the user that issued the DROP, and the transaction name DROPOBJ. Notice the LOP_LOCK_XACT operations that is logged right after the transaction start: HoBt 0:ACQUIRE_LOCK_SCH_M OBJECT: 5:245575913:0. This is important, because it gives us the object Id of the object being dropped at the moment it was dropped. Using this object ID we can further dig in the log and locate other DDL changes, just as I showed above. Is important to realize that object IDs can be recycled, after an object was dropped another object can be created using the same object ID (trust me, it can happen). So do pay attention and make sure that when you follow an object ID you are looking at the relevant log records, not the log records of a completely unrelated object that happens to reuse the same object ID. Remember that the log record LSN establishes a clear time ordering of events so it should not be too hard to figure out such a case. Is also important to realize that the CHARINDEX(cast(N'test' as varbinary(4000)), [Log Record]) > 0 condition could retrieve log records for drops of other objects that simply contain 'test' in their name. This is not the only place where some of these techniques can misfire. These techniques are quite advanced, not meant for everyday users. I expect you to exercise quite advanced judgement. Try to corroborate the information found through multiple methods. Use common sense. Great post. The tip about dumping the log to a temp table is a good one. Thanks.